Break down dirt, grease and oil faster with hot water, and clean entire rooms in record time with the Big Wheel Extractor. Independently controlled electrical buttons, front-mounted switches, pressure controls, and a front-mounted drain hose help make this extractor easy enough for anyone to operate. 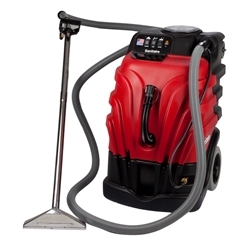 Break down dirt, grease and oil faster and more efficiently with hot water cleaning. 12” wand, 15’ hose and 100 PSI of water pressure clean entire rooms in record time. Independently controlled electrical buttons and front-mounted switches make operation easy. Built-in handle and 10” transport wheels means it loads easily into the back of a truck bed or up stairs or curbs.